Don’t throw out those dated vinyl roller blinds. 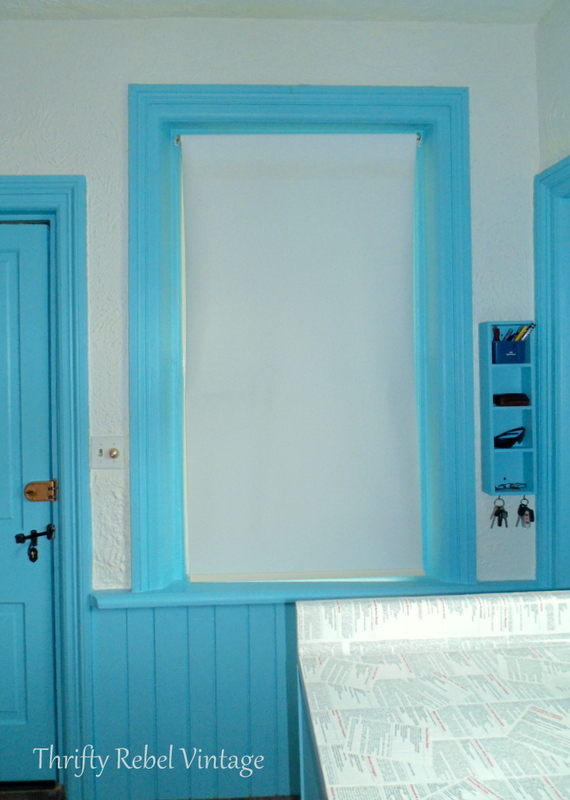 This cheap and cheerful vinyl blind makeover is an an easy way to give them a whole new look with little or no money. Because I already had everything I needed this is the least expensive of my kitchen makeover projects at zero dollars and zero cents. Yay!!! All it took was a little time and a fair amount of patience. This is the kitchen window that looks out onto the kitchen porch. That’s the entrance door to the left, and a little pantry/storage room on the right.There are two other windows in the kitchen that you’ll see at the end of this post. While these vinyl blinds aren’t the most attractive window treatments in the world, they do serve a very important purpose. They help to keep our house cool in the summer by blocking the heat from the sun. So I was pretty sure when I started my kitchen makeover that the blinds were going to be staying, but they definitely needed a new look. 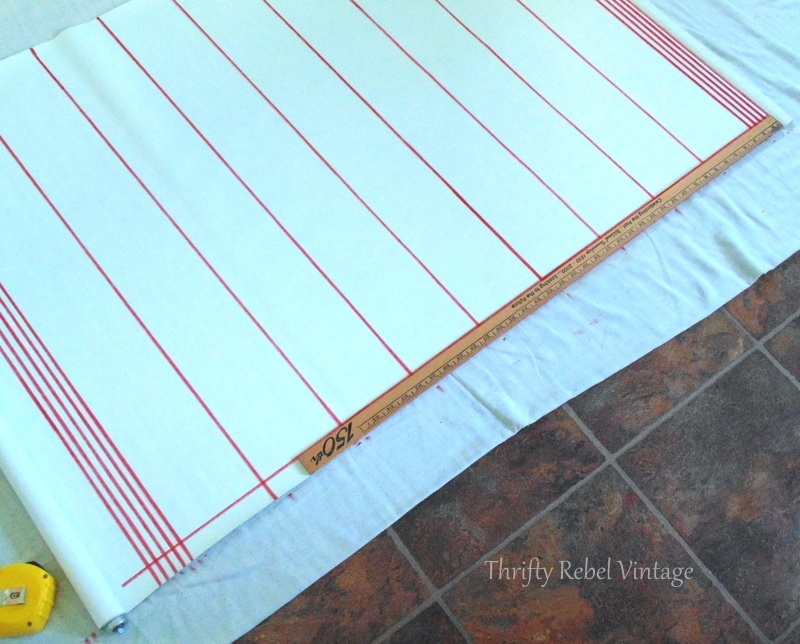 I got the idea for this vinyl blind makeover from my rolling pin window valance project. 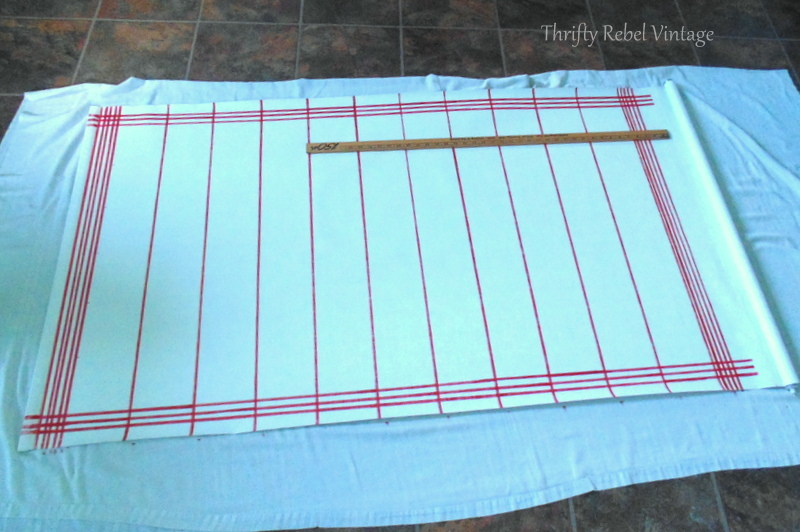 I took inspiration from the tea towel that I used for that little window, and the only other things needed were a yardstick, a measuring tape, and a permanent red marker with a chisel tip. My blinds have been up for about 12 years without a real washing, just spot cleaning when needed, and even though they didn’t look very dirty I gave them a light cleaning with a damp paper towel. 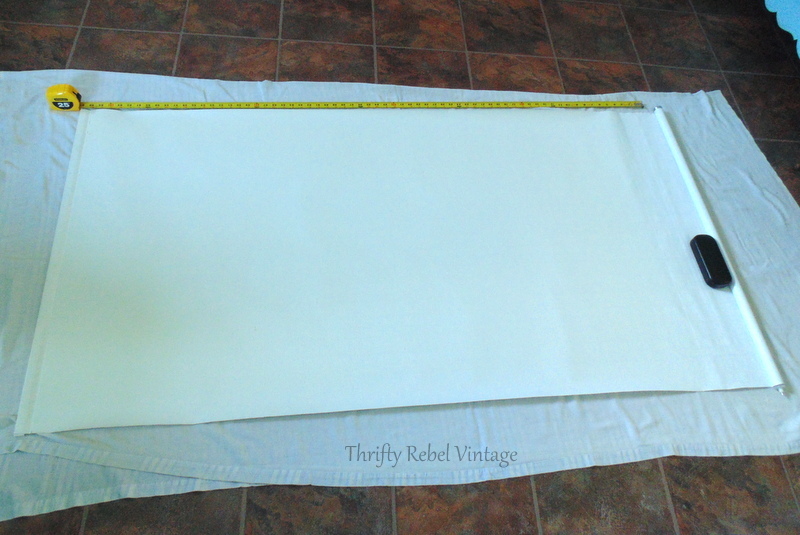 Then the first thing to do is lay out your vinyl blind to its full length when pulled down in the window. 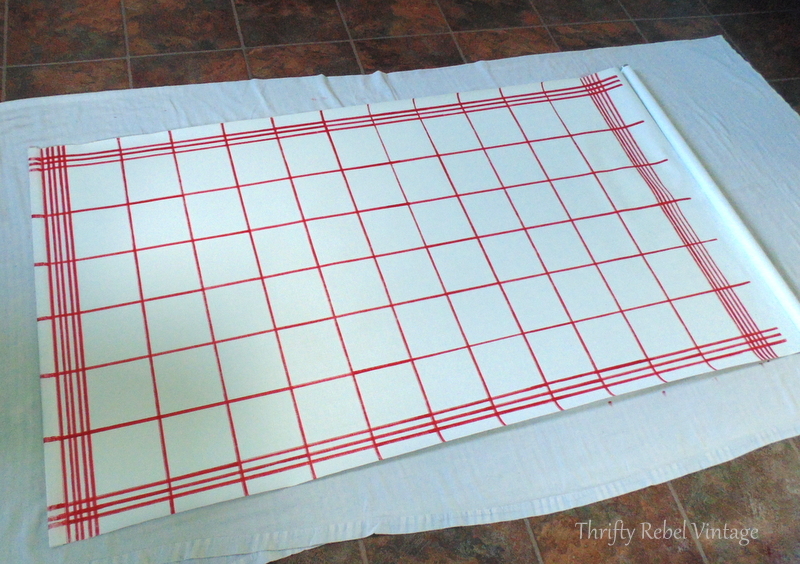 The tea towel pattern is very simple, but because the blind is much larger I customized a pattern that I thought looked good. I started with 5 horizontal lines across the bottom. No real reason why, it just felt right. Don’t worry about the spacing too much, it’s ok to just wing it. 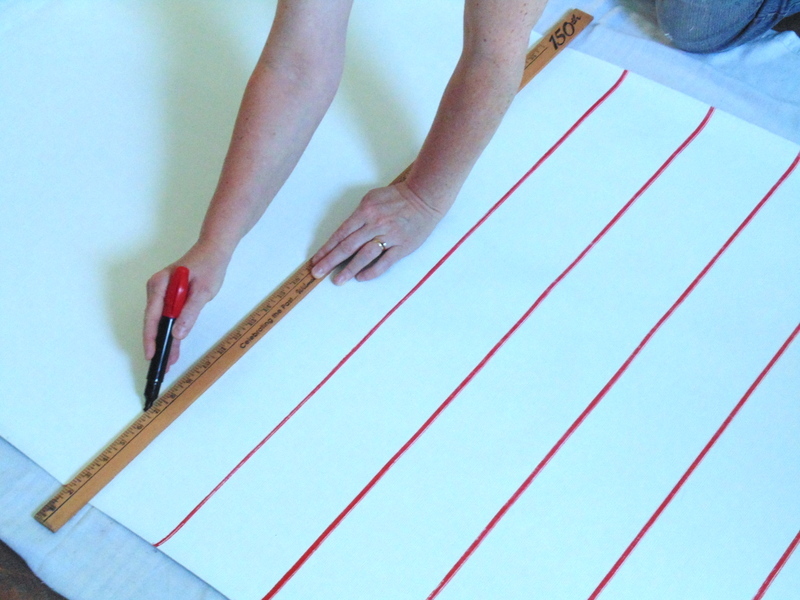 Then I measured how far apart I wanted the rest of the horizontal lines to be. Mine are about 5 inches apart. After marking both sides of the blind I added all the horizontal lines. When I got to the top of the blind I did another 5 lines just like the bottom. I’m a symmetry loving kinda gal, and most tea towels have that going on so this made sense to me. Then it was time for the vertical lines. 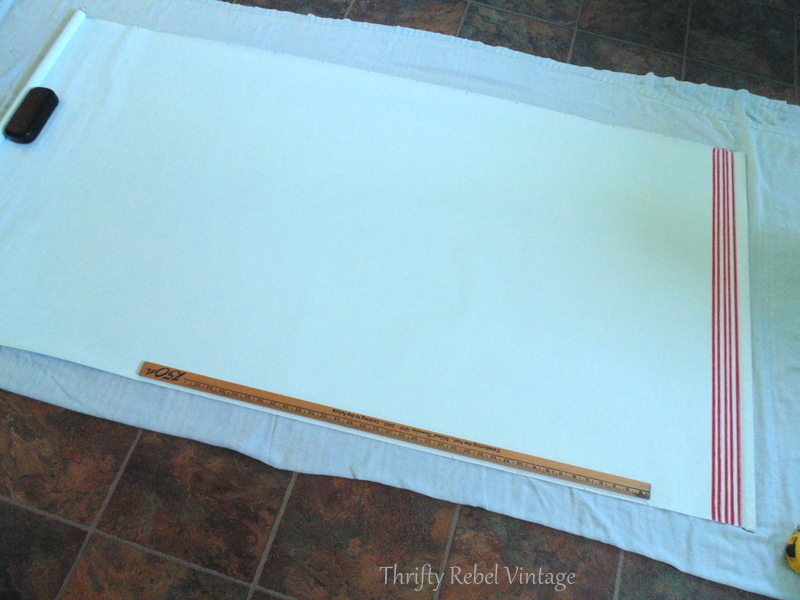 For me the easiest way to start this was by lining the yard stick along the outside of the blind and adding my first line. I added two more lines and then did the same three lines on the other side. 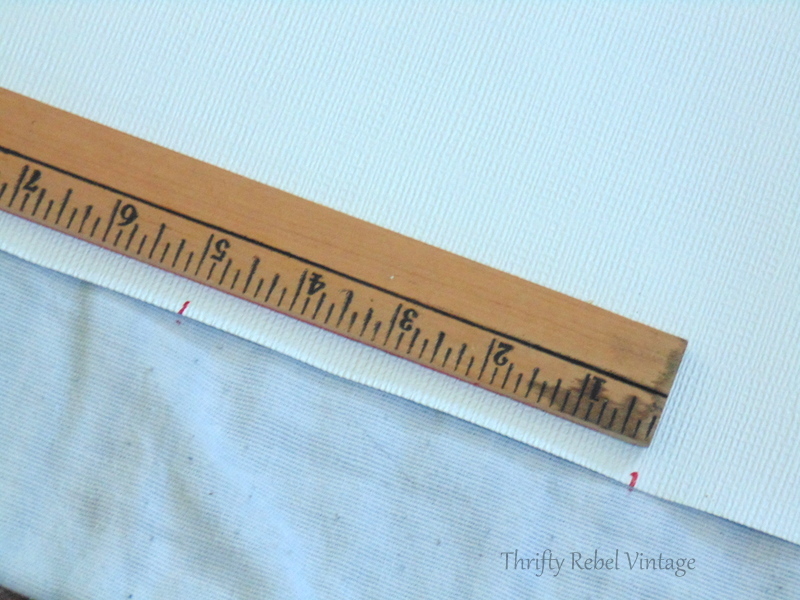 Then I measured and marked where the rest of my vertical lines needed to be so they would be evenly spaced. For this blind equal spacing meant adding 5 vertical lines. 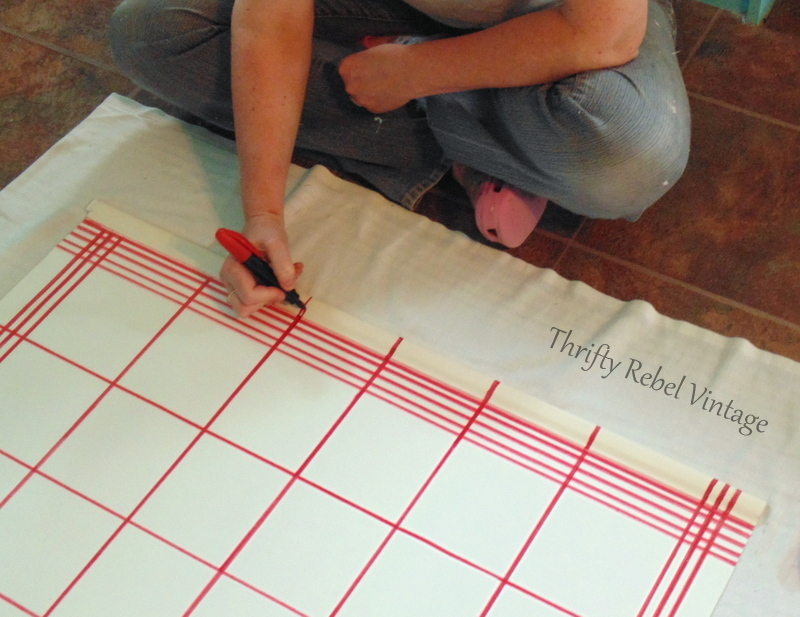 The lines could be spaced any way you like to create any kind of pattern that works for you. When all the lines are done, the finishing touch is continuing the lines down the bottom of the blind over the wooden piece by hand. It never occurred to me while I was doing this that I could have removed the wooden insert to make it a little easier, but I got it done just fine. It already looks so much better. Here’s my rather boring and bland window before. And my faux tea towel after. 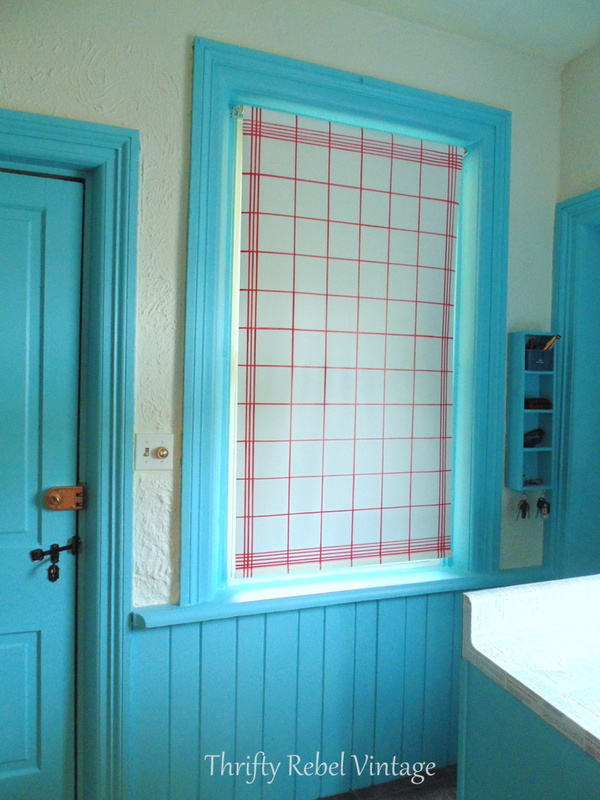 When John saw this first tea towel blind I did he said it didn’t even look like vinyl anymore… it looked like fabric! That was so awesome to hear, because he’s right. It’s amazing how this simple treatment tricks your eye into thinking it’s something it’s not. 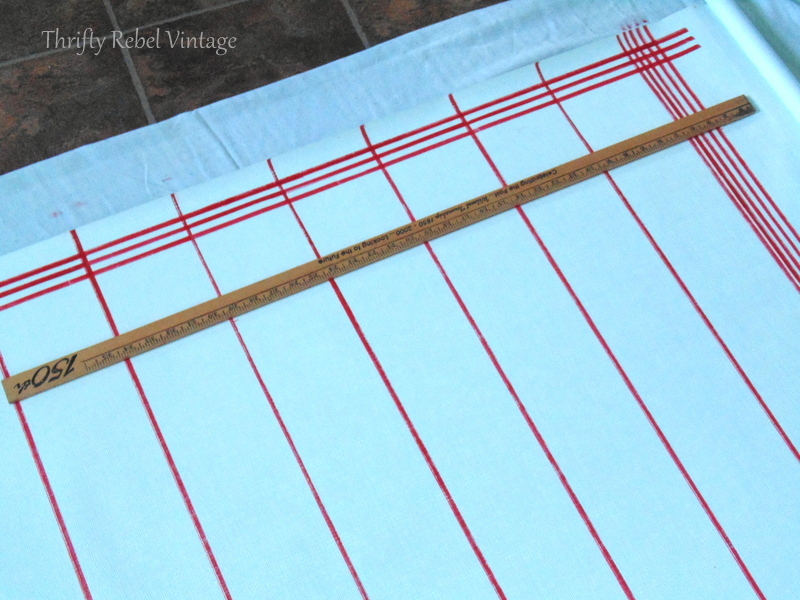 This red and white tea towel look fits in perfectly with my aqua and red kitchen makeover, but it could easily be done in any other colour. Here’s one of the windows over the main kitchen counter area. And the third window over the sink. 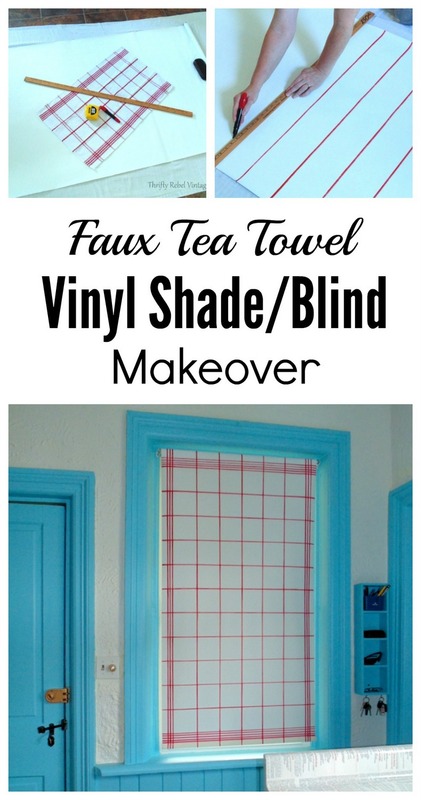 So if you have some of these bland and boring vinyl blinds instead of getting rid of them consider giving them a faux tea towel makeover. The only thing to remember is that it’s best to spot clean the blind when needed rather than washing it all over because the ink may run a bit. For me that’s no biggie, these blinds will be up for another 12 years before needing a real cleaning again. 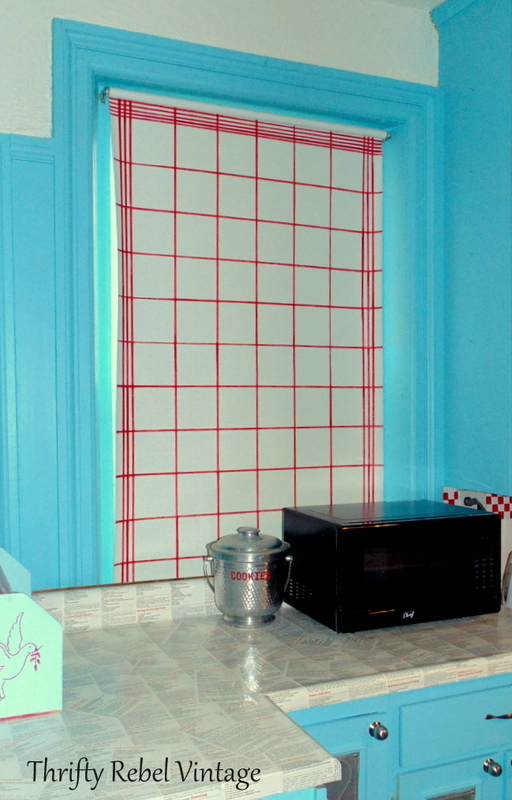 This simple vinyl blind makeover totally changed them into something fun and interesting, and really adds one of the final finishing touches to my kitchen makeover. They are still perfectly operational, and the fact that this didn’t cost me anything is a huge bonus because honestly I had no budget for new window treatments. I just need to to get some repurposed window valances done, and a new light fixture up over the sink area and over my kitchen table and chairs. Then hopefully I’ll be ready to share the whole kitchen reveal. I’m so excited to be finally getting down to the home stretch!!! 🙂 Now if I could just stop adding projects. lol. Boom!!! Mind blown!!! This is such a stunning transformation! 🙂 I love it and it looks an absolutely stellar custom, fabric blind!! :))) Thank you for all the details. Thanks so much Christina! I wasn’t sure how it would turn out when I started, but I’m very happy with the results. I love it! We call those shades here, and blinds are adjustable slats, so I was a bit confused with your title. I had all ‘shades’ in my last house so could have used this suggestion, except it was a rental and the landlord would not have appreciated ‘defacing’ his shades. My new place has all ‘blinds’. I like the look of the blinds but really hate to clean them! I was confused too. Blinds have slats. 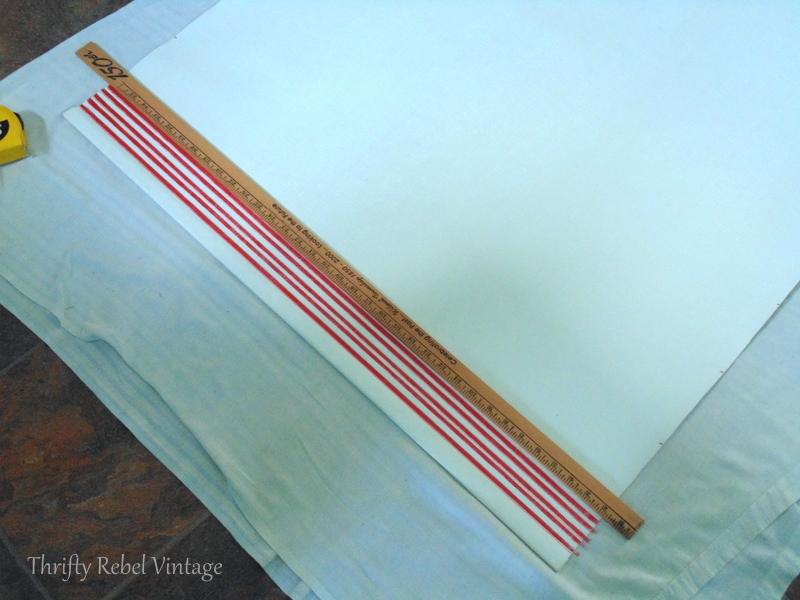 Shades are a solid piece of vinyl or fabric. So now i’m wondering why you couldn’t draw your pattern right onto the shades with something permanent that wouldn’t wash off? They do look very pretty. Thanks Annette! We call them blinds here, but I know they’re called shades in many places. The permanent marker I used has held up beautifully, and it’s almost two years since I did this project. I have done spot cleaning and it hasn’t caused any issues. Oh my, how creative! You have the best ideas, Tuula!!!! Your shades look amazing! Thanks so much Gail! Having no budget forces me to try to find creative solutions using what I already have. And it’s fun to challenge myself. Another amazing project! I had no idea where you were going with the simple tools an Wow! I don’t cheat and always wait till the reveal because I love seeing the process. You make it look so simple!! Neat idea…can you still roll them up?? You could also do something with decals or contact paper. So many ideas come to mind…started with your unique adventures. In the very first photo, I noticed a black door latch, right under the gold bolt. It looks old & adds to the vintage look. Thanks Linda! The black door latch and the door are original to the house, which was built in 1890. 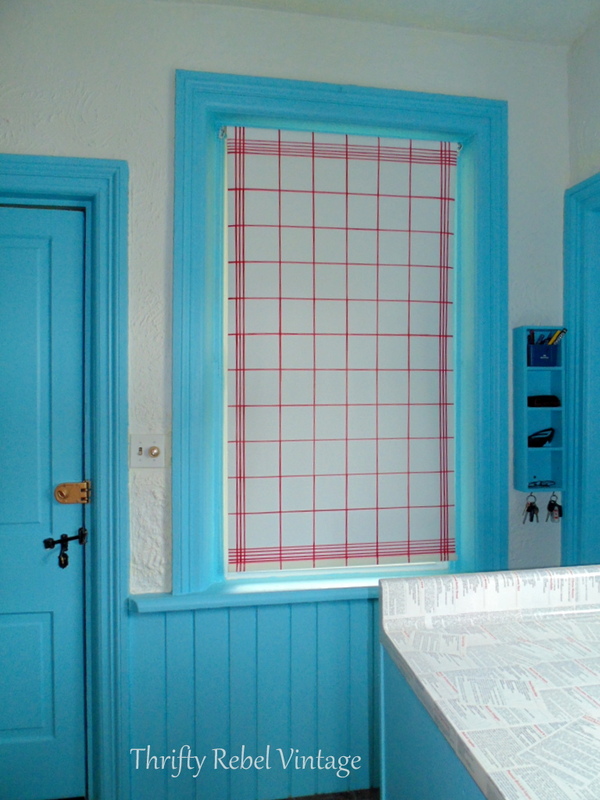 We do love its period features, but I enjoy adding some fun with colours and patterns. My kitchen blinds are still perfectly operational. Because I was only using marker it didn’t inhibit them at all. 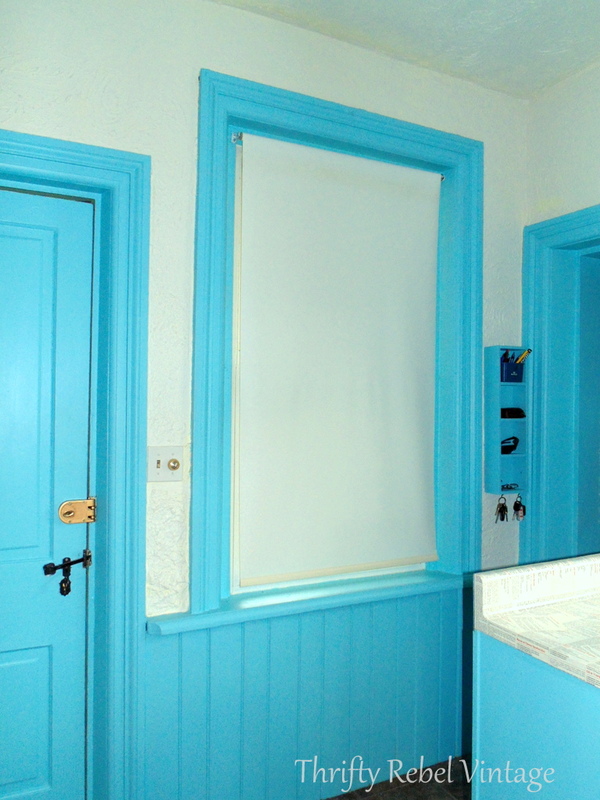 I did some fabric covered roller blind makeovers in the master bedroom and they work perfectly too. I agree, there are so many ways to dress these blinds up. That is such a clever and original idea. Your kitchen looks so inviting. 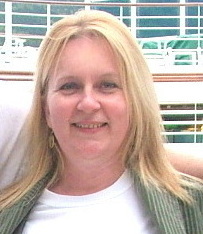 I’m enjoying your blog and look forward to more of your clever projects. Tuula, This is adorable! 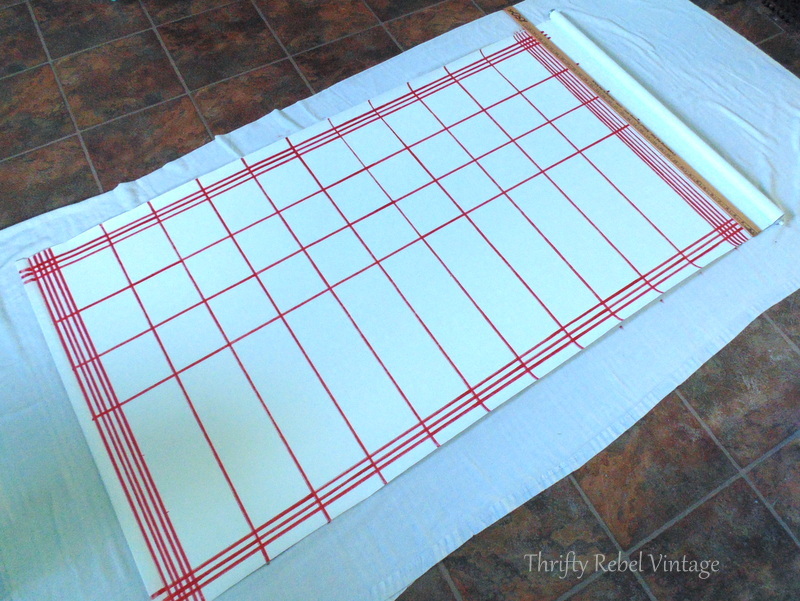 Such a cheap & easy way to turn bland blinds into something special! 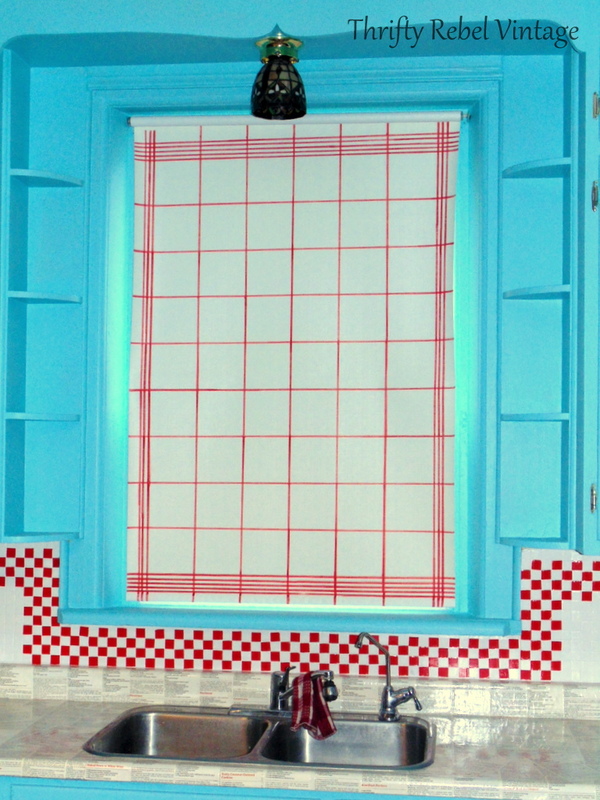 Your kitchen is going to be the happiest place with all those fun colors! Can’t wait to see the reveal! Your kitchen makeover is awesome. So many great ideas 🙂 Thanks for sharing the process. Thank you so much Mother Deer! I’ve thoroughly enjoyed sharing it here, but I must say I’m happy to be almost finished. I’m looking forward to moving onto another room. Tuula, this is wonderful! I’d never know it wasn’t an actual tea towel–great job! Thanks so much Cecilia! I’m quite happy with how they turned out. Brilliant! I never would had thought of doing something like that……Only you with such a creative mind. What a beautiful transformation. Looks like a regular t-towel hanging up. Thanks Colleen! That’s just the look I was hoping for. I’m always on the look out for these roller shades when thrifting. I don’t use them in my windows though. I keep a small (2-3) stockpile to create banners. I am involved with many community organizations and those shades make spectacular banners for events and functions. I use sharpies for the lettering and any artwork. I might have to re-think using a few in my house now with such a cool idea as yours! Thanks Debbie! 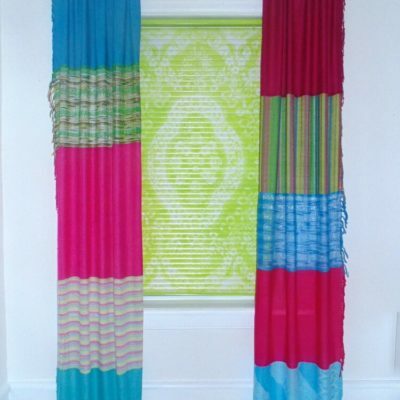 Banners are a great repurpose of these roller blinds. I think they can be repurposed in many ways. I’m keeping one for a future art project. Sooo cute! I love it! 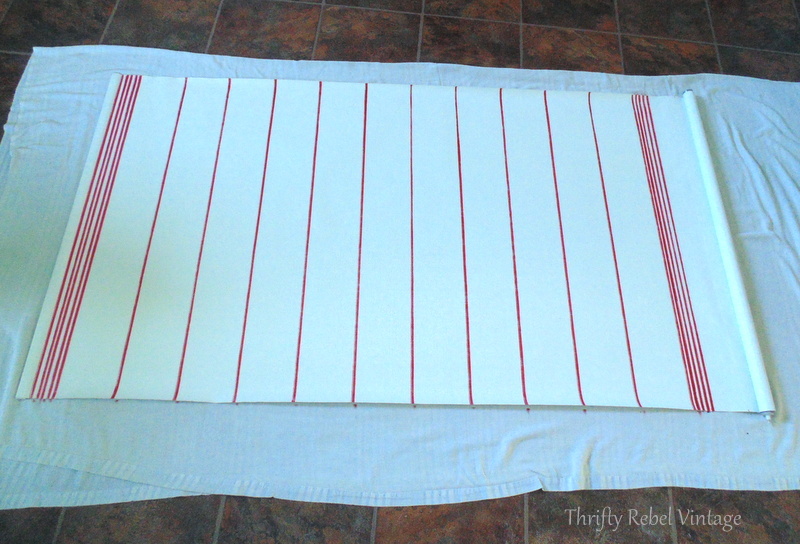 From here it looks just like a tea towel, and it goes great with your other red items in the kitchen! I love everything you’ve done so far & I can’t wait for the final reveal! his is so dang cute and clever as are your bedroom shades! I am so gonna try this…Thank you! Tuula this is so impressive! With nothing you created something that looks fabulous! My kinda project. Your kitchen is really coming together beautifully! And I swear they look like tea towels to me! This is such a cheerful, vintage look. When I first looked at the photo, I thought it was a real tea towel. 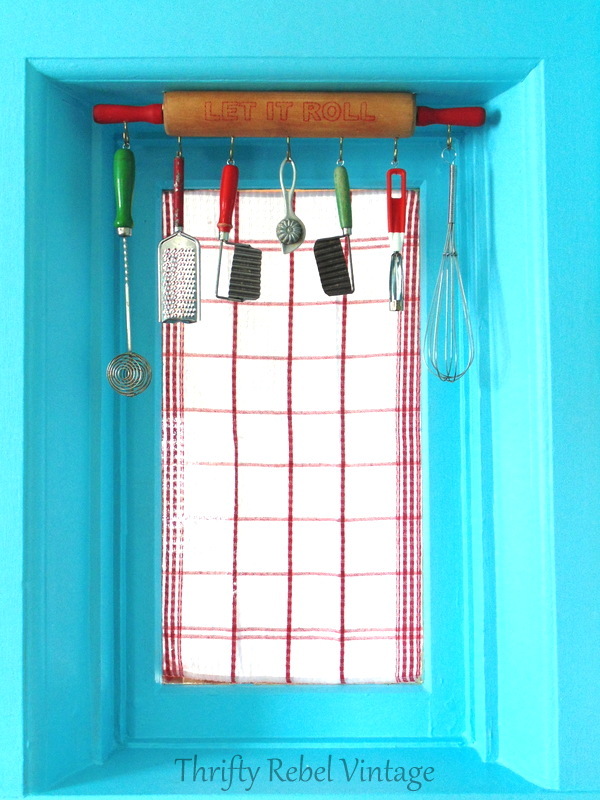 I love the vintage kitchen utensils hung as a valance. So cute! Thanks very much Carol! I love to display my vintage gadgets in fun ways. What a cute idea, and so easy to do. I need to do something about our kitchen window, because in the evening the sun shines through and blinds us. This would be fairly easy to do. Thanks for sharing! Thanks Linda! Our kitchen windows face east so we have that problem in the morning, and on very hot days the blinds really help keep the heat out too. This is very easy and inexpensive solution. I love this! As I was looking through you kitchen makeover posts, I kept wondering where you got the large vintage kitchen towels. I was stunned to see they were not fabric but drawn on with permanent marker. 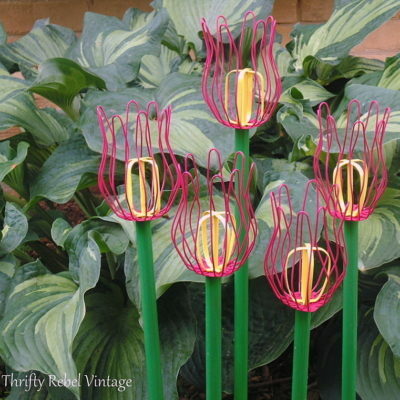 What an amazing Thrifty idea. You really have the talent for doing things on a budget like no one I’ve seen before. I’m a new subscriber as of today and cannot wait to view your future posts. I will probably spend the rest of the morning viewing your blog. Keep up the great work! By the way, your valances are genius! And awesome way to display your vintage kitchen gadgets. 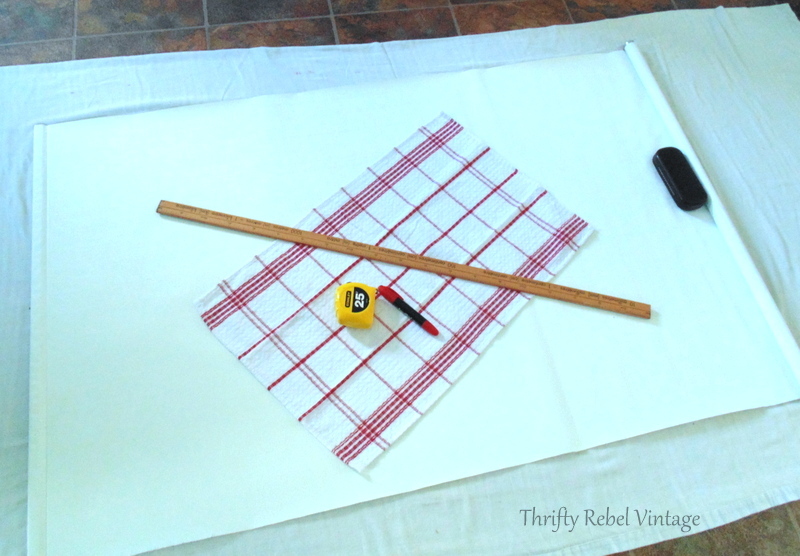 I will be sharing this on the Vintage sales Facebook page that I administer, to show how you use the rolling pins and gadgets as valances. Until next time Keep On Keepin On. J e r i.? I am wondering if there will be a problem of the red marker eventuality bleeding onto the rest of the shade when it is rolled up. Have you had any issues with that? Your shade, as we call it here, looks nice; but, I want to hear the details on your counter top. It looks like newsprint, maybe? Very interesting! Thanks Anne! 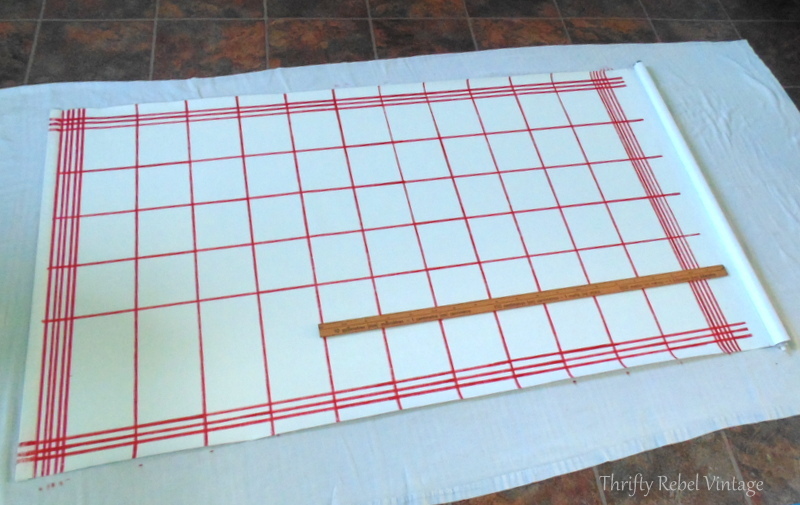 I gave my old laminate counter tops a makeover with recipes cut out of a book. I did a post about it and you can find it on my blog. Go to the top of my blog sidebar where it says ‘search this website’ and type in the word counter and the post on my counter makeover will come up. Check it out. After two years I’m still loving it! I love your shades. I have them in 3 kitchen windows. I couldn’t believe my eyes when I saw your post. Some one else uses window shades AND knows how to bring them to life. I love what you did to them and I like the name of your blog. Thanks for posting this. Thanks Elizabeth! Shades are very practical, but they don’t add anything decoratively so I had to do something. Now I love them instead of just putting up with needing them. I’m so glad my project has inspired you!